Tyson Foods is recalling more than 130,000 pounds of chicken nuggets, as the chicken could contain pieces of hard plastic. 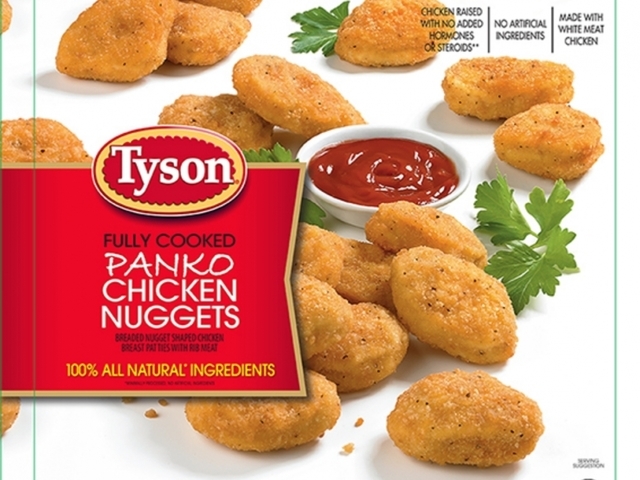 According to the USDA , Tyson’s voluntary recall applies to 5 pound bags of “Tyson Fully Cooked Panko Chicken Nuggets” and 20 pound bulk packages of chicken nuggets. Both bags contain “Best If Used By” dates of July 18, 2017. The 5 pound bags were sold at Costco stores throughout the country, and the 20 pound bags were sold to a single wholesaler in Pennsylvania. According to Tyson Foods, the pieces of plastic could have come from a rod used to connect a “plastic connector belt.” Tyson says they use a metal detector to try and find foreign objects in their food, but the plastic pieces slid by. Customers affected by the recall are encouraged to throw the chicken nuggets away and call Tyson Foods’ Consumer Relations at 866-328-3156.